This April, Wild Apricot is hosting the Membership Growth Online Summit, which features 6 back-to-back expert webinars over a whole week (that's more than 1 per day, for all you mathematicians)! So, what better way to speed up your CAE designation than by attending all 6 webinars. Not only will receive 6 full CAE credits, but your mind will be filled with some of the best strategies on how to ramp up your organization's membership growth. 6 Free CAE Credits + 6 Awesome Membership Growth Strategies = Double Win! And the best part? It's all absolutely, 100% free! Step 1: Sign up for the Summit. Wild Apricot is dedicated to empowering nonprofit professionals with education and resources to help them grow their organizations the next level, so please help us spread the word! Tell everyone you know! Tell your friends! Tell your family! You can even tell your pets (we love animals). 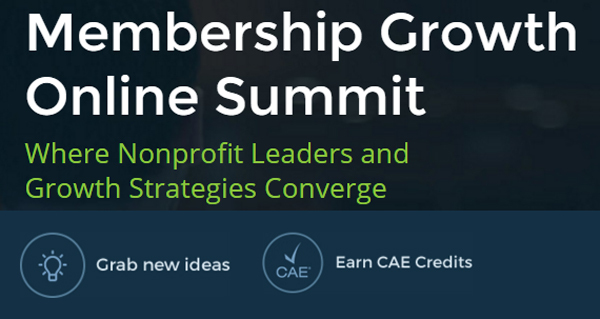 We want this year's Membership Growth Online Summit to have the biggest impact on the nonprofit world as possible!